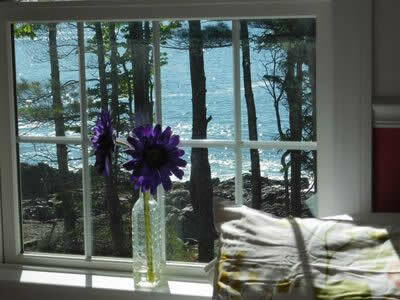 Rising Sun Cottage: The most fabulous views! Once seen, always remembered! View for Sounds of the Sea Bedroom. You can almost reach out and touch the ocean! ﻿Whether you are in Rising Sun Cottage, built high on the granite rocks that tower above the coastline, or in Sound of the Sea, our shoreline house, the natural surrounding of the houses fills one with constant awe and ignites the imagination. We have 330 feet of totally private shore frontage, on Frenchman's Bay, with 210 degrees of bay and ocean views from the rocky ledges and cobblestone beach. Sit on the rocks, dip your toes in the water (brrr! ), meditate, gaze out on Bald Porcupine, Ironbound, Egg Rock and Thrumcap islands. 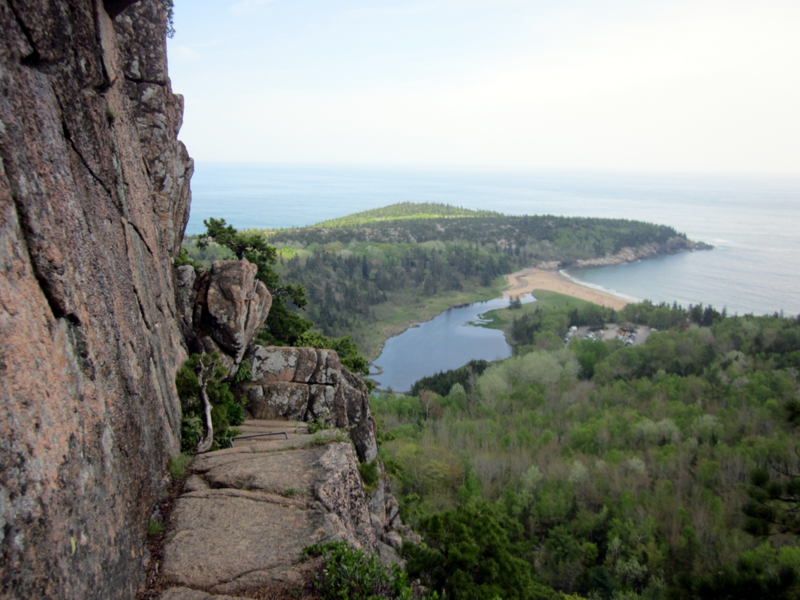 Close your eyes, listen to the sounds of the sea, feel the caressing breezes as us and allow yourself to be one with the soul of the land that is the essence of Acadia National Park. Imagine! 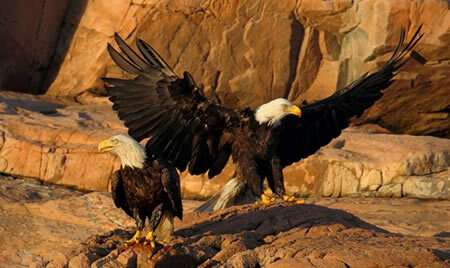 We often see eagles, ospreys or seals as well as lobster boats, sailboats or kayaks passing by. The sun rises spectacularly over the ocean each morning Dusk offers the sun setting over Champlain Mountain. ​At dawn or dusk, absorb the beauty of Frenchman’s Bay. At night, gaze up at the quite amazing Maine starlit sky. You'll almost certainly see a shooting star! 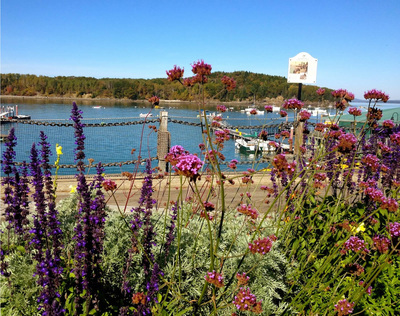 ​Sols Cliff Road (our home is at the end of it) offers a pleasant stroll, and if you wish more exercise, a Park trail is about 3/4 of a mile away and it is a very walkable 1.5 miles into the center of Bar Harbor. 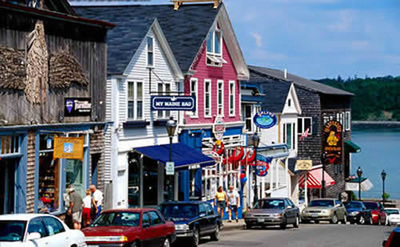 The town is a funky place with lovely shops where you can find some beautiful items, some yummy restaurants and also shops cater to the National Park visitors that crowd Maine Street in summer. 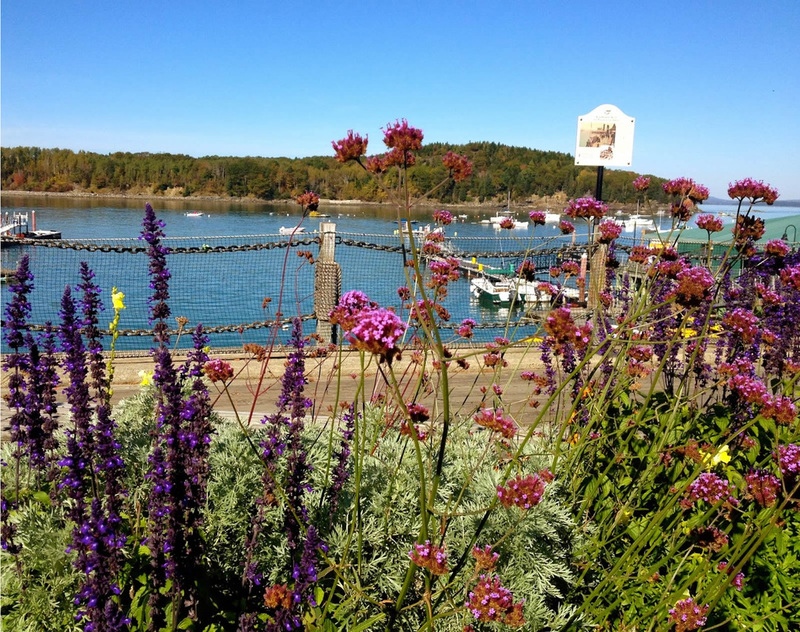 It's always fun to walk around, shop, go down to the harbor and get some ever abundant Bar Harbor ice cream! 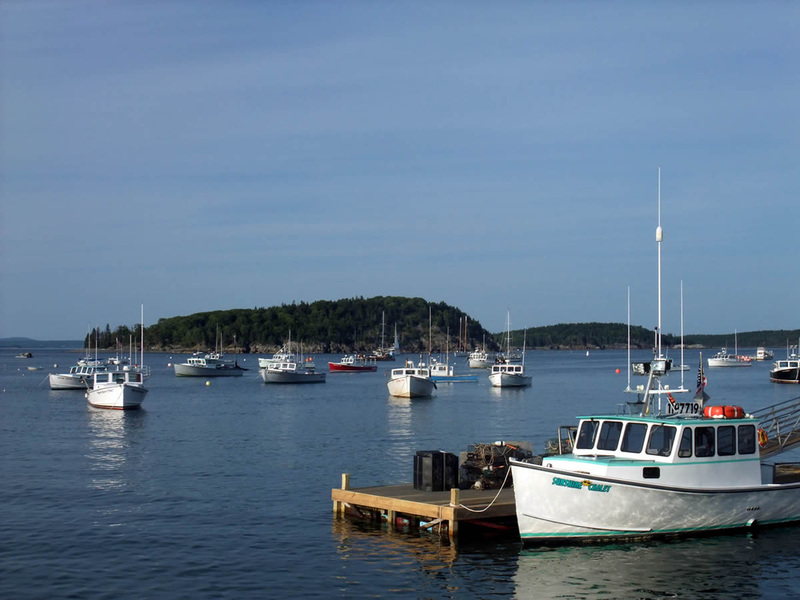 We’ll have ample time to enjoy the myriad pleasures of Acadia, which is well served by free public buses (electrically powered) that stop at all the most spectacular vistas and trailheads. Or you can drive. 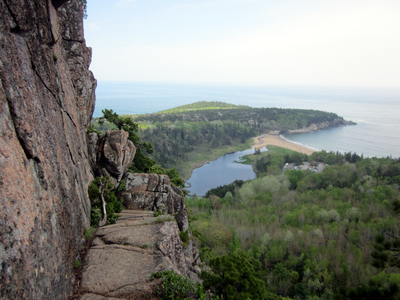 Acadia has both mountains and seashore, both ranging from easily accessible to strenuous. When my husband and I were young, we hiked every day. But now, we stay closer to the ocean, which never ceases to calm and amaze us. Acadia offers a wealth of possible activities: the Naturalist boat cruise in Frenchman ’s Bay, during which you’ll usually see eagles, osprey, seals and numerous other birds; kayaking tours; extensive bicycling opportunities, either by yourself or in a tour; canoeing; hiking, ranging from simple walks on the flat, beautifully groomed carriage trails, to strenuous climbs in the pristine mountains; walking and sitting along the rocky shores; enjoying the magnificent views from the free bus tours; the peak of Cadillac Mountain, the highest point on the Atlantic coast north of Brazil; sail boat excursions; and on and on.